Hampered by cancelled orders and delays in construction of offshore facilities, the world’s three largest shipbuilders are tracking to record major financial losses in 2015. To date, South Korea’s “Big 3”—Hyundai Heavy Industries, Daewoo Shipbuilding & Marine Engineering Co. and Samsung Heavy Industries—show a combined loss of 8 trillion won (US$7 billion), Hellenic Shipping News Worldwide reported Thursday (Oct. 29). Through the third quarter, the 'Big 3' South Korean shipbuilders are showing a combined loss of 8 trillion won (US$7.8 billion), reports say. The news should not have been unexpected, as the three shipyards reported massive losses in the second quarter. The 4.8 trillion-won (US$4.1 billion) combined loss reported in July was worse than anticipated by analysts and a historic worst for South Korea’s shipbuilding industry. However, an earlier (Oct. 27) report from Hellenic Shipping News indicated that analysts were expecting that earnings before interest and tax at Hyundai Heavy would be positive in the third quarter. According to recent reports, Hyundai Heavy has recorded 3.24 trillion won (US$2.83 billion) in losses, largely from offshore projects, Daewoo Shipbuilding has lost 3 trillion won (US$2.63 billion) and Samsung Heavy has lost 2 trillion won (US$1.75 billion) over the year. 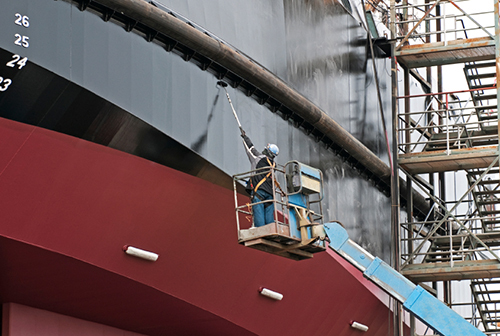 While most of the shipyards’ losses are attributed to offshore facility projects in play since 2010, the delivery of underpriced ships, a rise in shipbuilding costs and increased costs stemming from delayed construction off offshore projects also contribute to the financial hurt. Losses for the year are expected to reach 10 trillion won (US$8.76 billion). According to BloombergBusiness, Hyundai Heavy Industries was hit the hardest during the third quarter, showing a 434.1 billion won (US$380 million) net loss. The reported operating loss was 678 billion won (US$593.7 million). These losses far exceeded those that analysts had originally estimated the company would experience. Those estimates had forecast a 61 billion-won (US$53.4 million) net loss and a 14.6 billion-won (US$12.8 million) operating loss. This will be the company’s second consecutive year posting a loss. Hyundai Heavy had shown a net profit of 146.3 billion won (US$128.1 million) in 2013, before beginning a slide with a 2.20 trillion won (US$1.93 billion) net loss in 2014. Its operating profit in 2013 was 802 billion won (US$702.2 million), before suffering its largest-ever operating loss of 3.25 trillion won (US$2.85 billion) in 2014. The company pointed to a canceled semi-submersible rig order, the termination of a renewable-energy venture and a drop in oil prices as contributing to these losses. Samsung Heavy, however, logged a net profit of 51 billion won (US$44.7 million) during the third quarter, besting analysts’ estimates, according to reports. The company indicated the profit partially resulted from a client payment following requested changes to an Australian offshore project. Additionally, if it succeeds in a planned merger with its Samsung Engineering affiliate, that may also lift the shipyard’s financial standing, reports said. 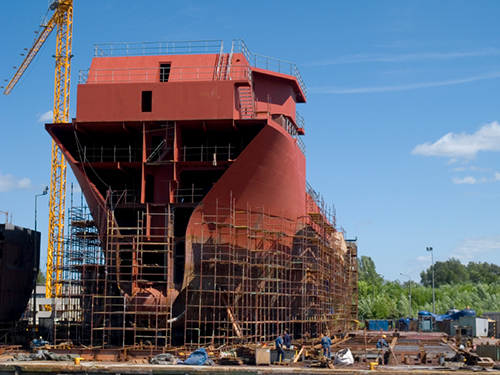 While most of the shipyards’ losses are attributed to offshore facility projects, the delivery of underpriced ships, a rise in shipbuilding costs and increased costs from delayed construction also contribute to the financial hurt. Still, according to Park Moo Hyun, a Hana Daetoo Securities Co. analyst, “Investors are hoping that Samsung Heavy’s profit signals a turnaround for shipbuilders. The company was negatively affected by a customer’s request in August to defer delivery of several drill ships, BloombergBusiness added. Daewoo Shipbuilding, too, is expected to be back on the profit side by the first quarter of 2016. The company is reportedly in talks with its creditors that may lead to a financial bailout. At this time, Bloomberg reported, the anticipated infusion of as much as 4 trillion (US$3.5 billion) won was halted as a result of criticism of the taxpayer-funded bailout. Project delays are said to have forced the shipbuilder to take on more debt. In an effort to raise money to keep afloat, the company is selling non-core assets (including its headquarters building, a golf course and wind energy business), reducing its operational presence at an underperforming Romanian shipyard and reducing its workforce. According to reports, with falling oil prices and oil and gas producers cutting costs, the shipyards should not expect to bring in many new orders for the time being. “The biggest reason why shipbuilders are struggling is because of the delays in offshore rig projects, and until the deliveries are made, these projects will continue to weigh on the shipbuilders’ profit,” Park Moo Hyun said.